Well my racing in the UK is finished for a couple of months over the summer as I head off to California. A mix of holiday and sailing, hopefully for some good racing on a J120, some tall ship sailing on Pilgrim based at the Ocean Institute at Dana Point, and helping youngsters at the Los Angeles Maritime Institute in San Pedro learn to sail on brigantines. After last year's light wind event, this year was excellent sailing conditions - sunny and building to a nice F4. I really enjoyed my second Round the Island race, this time aboard Old Mother Gun, a superb Humphrey's designed 40ft yacht. After a busy start line and a relatively quick race around the island with some tight tactical racing we were placed 7th out of 45 in Class 1C. The weekend of the 20th June proved interesting as I had numerous offers to sail in a variety of events, including the Impala 28 Nationals on Magic, but was at my cousin's wedding all weekend... I was able to get down to the Solent however to do the final day of the Impala 28 Nationals on Magic on the Monday as main trimmer. We finished 6th overall though had been hoping for a slightly better result but the leaky keel bolts possibly didn't help... so we dropped it off at the boat yard after the event to be looked at. Two short races over the weekend of the 16th and 17th May and once again I was on NJOS. The first race took us east from the start near Cowes before doubling back just east of the Portsmouth Forts all the way to Yarmouth. the forecast 15 knots of wind actually turned out to be a rather more with the odd 30 knot gust but I thoroughly enjoyed my stint on helm from the forts all the way to Yarmouth. Sunday dawned with a light breeze for a leisurely return race. On the 18th April I was on NJOS again for the Nab Tower race - a race from Cowes to a point just off the east coast of the Isle of Wight and back. On the way out we picked up a helm who the skipper knew from another boat that had just retired and so for this race I took over jib trim. A windy and bumpy 4 hours later we were back in Cowes and classified 7th in class. The opening races of the JOG series were over the Easter weekend from Cowes to Cherbourg and then back again. I have joined NJOS for the JOG Series - a fast Corby 35. I had sailed on NJOS just after I started out in yachts but for the JOG Series Tim, the skipper, has asked me to be one of the helms - a challenge I am relishing. We set out on the Friday in light winds and it proved fickle for the whole crossing. One of my strengths is getting good boat speed in light winds and I was able to get some good speed out of NJOS despite the shifty and light winds. After 12 hours of racing we made it Cherbourg and were classified 6th in class. Unfortunately the wind didn't play ball for the race back and it was cancelled and so we had a leisurely cruise back to Cowes. The weekends I wasn't at WPNSA with the BKA I have been taking part in the Royal Southampton Yacht Club Frostbite Series on Magic, an Impala 28. In addition to looking after main trim I really enjoyed calling a lot of our tactics in this series which always produced some tight racing and where the right call can quickly make or lose places. We had some good results and were pleased to finish a very creditable 2nd overall in our class. Through January to March, I was with the British Keelboat Academy for four weekends of coaching at Weymouth and Portland National Sailing Academy. We used the Elliot keelboats and although a bit smaller than the yachts I have been sailing it gave us a great opportunity to hone our skills in different positions with some great coaching and tight boat-on-boat racing. I certainly learnt a lot and really enjoyed the weekends and I am looking forward to putting it all into practice in the up and coming events. In November I was very pleased to be offered a place in the RYA British Keelboat Academy (BKA) which is a is a partnership between the RYA and UKSA. The BKA is designed to support the country's best young sailors aged between 18 and 24 develop the skills needed to take their keelboat yacht racing to a professional level. We had our introduction session at Bath University in November and then during January - March next year we will be down in Weymouth and Portland Sailing Academy for four weekends of coaching. Over October and November I have been on the J/109 Jybe Talkin' for the Hamble Winter Series. As a crew we have been learning a lot in what has been some close racing in the J/109 fleet. I have been on main trim and jib trim for the most part and have enjoyed extracting that last bit of speed from the boat. Had an enjoyable race from Cowes to Poole and back on the J/109 Jybe Talkin'. Some good wind most of the weekend and although our results weren't spectacular we learnt a lot. As we are getting towards the end of the summer sailing season I am now looking forward to the winter series and hoping to do the Hamble Winter Series on Jybe Talkin' - I think the skipper is going to do this in the J/109 class so that should be good for some close tactical racing. One more short JOG race left too in October. Well a weekend of no wind meant that we decided not to do the race - about the half the fleet did give it a go but it took them some 20 hours to get to France - and then other than the French boats they all had to get back with little change in the conditions... So we spent the time enjoying the delights of Cowes (we sailed over there to take a look at the start before making a final decision and ended up spending the night there) and then around Southampton before heading back home. Hopefully we will have more wind for the JOG Cowes to Poole to Cowes races. At the end of August I was very pleased to have completed and passed the RYA Day Skipper course with Stormforce Coaching. One more step towards my goal of getting to the full RYA Yachtmaster Ocean. The first day of Cowes Week opened with rain for the start of racing but soon cleared up and then for the first five days we had some good racing as the wind picked up from mid-morning each day. This week I was sailing aboard the Sigma 38 Gambit and we had a good opening start to the week with a 6th in the Sigma 38 class quickly followed by a 4th in class on the second day. That set the trend for the next few days with a 6th, 7th (the worst day with a few mistakes that dropped us down the fleet) and a 4th. During the week we had some close racing up near the front of the fleet and were hoping that we might be able to finish the week with a bullet, but then on Thursday morning we set out to the start line in light wind with a forecast that it was to fill in. But then we sat for a number of hours with the wind tantalising close up by the Needles but nothing down near Cowes until racing was finally abandoned for the day. Unfortunately the final day also dawned with no wind and when the organisers realised that there was no chance of it building, the week came to a close with no racing on the last day either. So with only five of the scheduled seven races completed unfortunately there was no discard in the series but we finished the week a credible 5th in our class. That was the last time I will be sailing on Gambit, at least with the current skipper and owner Cees Schrauwers as he is putting the boat up for sale. I will always be grateful to Cees for giving me my first real taste of yacht racing aboard Gambit, getting me hooked and giving me the enthusiasm to see how much I can now achieve in this side of the sport. I am looking forward to my next race, which will be my first cross-channel race, the RORC Cowes to Cherbourg. I will be doing on a yacht I haven't sailed on previously, In X Celis. And between now and then I am squeezing in my RYA Day Skipper course and a bit of casual sailing with friends. Well it was a light wind affair for the 1535 boats but we had a good event aboard the J/109 Jybe Talkin'. After 10 hours and 30 minutes racing we came 75th overall out of the 497 IRC entries and also 5th out of 37 in our IRC Division 2B class, and 9th J/109 of 31 entries. I really enjoyed the day working on the jib and main and a stint at the helm around St Catherine's Point as we overtook Sir Robin Knox-Johnston in his Open 60 Grey Power and an Open 40... On corrected time we even beat Sir Ben Ainslie who was sailing the Farr 45 Rebel...! Back aboard the Sigma 38 Gambit for the three day National Championships in Cowes. We had quite a few new crew members for this event and unfamiliarity for some of the crew with the boat, and between ourselves, meant we didn't do as well as we would have liked. However, a fabulous event and I really enjoyed the 4 hour long coastal race on the Sunday. The Sigma 38 is a great class for one design racing and I am learning a huge amount from the core team racing on Gambit. 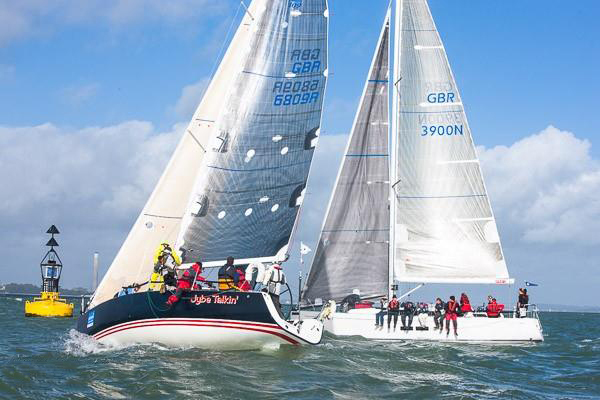 Over the Easter I joined the J/109 Jybe Talkin' for the RORC Easter Challenge. The skipper and a number of the crew also sail on Gambit with me so it was nice to sail on a new boat but with familiar faces. Jybe Talkin' has only recently been acquired and refurbished by the skipper and so as this was a coached regatta we went to learn ready for events coming up later in the year, including the Round the Island race in June. To complement when I am not on keelboats I wanted to keep my hand in dinghy racing and so have now fulfilled another passion - for skiff sailing. I have just bought myself an RS700 - a single-hander dinghy that RS modestly markets as a super quick trapezed genneker weapon... Sailing the RS700 has proven to be interesting (with plenty of swimming at the moment) but also great fun and I am looking forwards to doing some events on the sea and the big lakes over the coming years. I completed the two weekends of the Warsash Spring Championships aboard the Sigma 38 Gambit, the first yacht I raced on over the winter. We had a mixed bag with some great racing near the front but a few problems (including losing the jib sheets overboard...) to keep us on our toes, finally finishing 4th Sigma 38 and 7th out of 12 in the IRC3 class overall. Old Mother Gun is a superb 40ft offshore racing yacht and I really enjoyed sailing on her for the Nab Tower race, the first in the JOG Offshore Championship 2014. We came a very respectable 3rd out of 18 in Class 3. Towards the end of 2013 I came to a moment of reckoning and started to think very hard about how I wanted my sailing to progress. Since I started out in the sport I have had a longing to do offshore yacht racing and had a taster a few years earlier when I had been awarded a week aboard the John Laing, courtesy of MDL Marinas. I have also picked up some injuries over the past few years that impacted my dinghy sailing and so after much deliberation I decided that now was the right time to put my Olympic aspirations for dinghy sailing to one side and make a decisive move into keelboats. Over the winter I have sailed aboard a number of yachts in the Hamble Winter Series, in the main though I have been aboard the Sigma 38 Gambit and have loved every minute of it. In June I represented GBR at the Laser Radial Youth European Championships in Split, Croatia. This was quite an occasion as it was the same week as Croatia celebrated becoming the 28th member of the European Union. There were plenty of celebrations and a parade of the Laser fleet through Split harbour - certainly something to remember. After a difficult start to the event I managed to finish the week mid-fleet. I loved Croatia and made a number of Croatian friends that I plan to keep in touch with and look forward to an opportunity to go back again one day. On the 12th January 2013 we had a great time at the London Boat Show where I collected my award for RYA Regional Young Sailor of the Year 2012 (Thames Valley and London). It was great to meet the other winners there too and be introduced as one of the three finalists for the YJA Pantaenius Young Sailor of the Year Award. 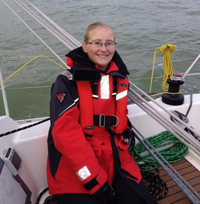 Although I wasn't selected as the overall winner this year, my congratulations to Saskia Sills as a very worthy recipient of the 2012 YJA Pantaenius Young Sailor of the Year. I have just been informed by the RYA that I have been selected to represent England in the Home Nations Championships on the 2/3rd February 2013 in Largs. There are 6 of the top Laser Radial youth sailors (and also 6 Topper junior sailors) from each of the four home countries of England, Scotland, Wales, and Northern Ireland and so it will be a great opportunity to compete with the top sailors from around the UK during the mid-winter training months. After a summer of international events it was time to knuckle down for the Autumn Laser Qualifiers which were the indicators for the RYA Volvo National Youth Squad selection. The first two events went well, especially as my ribs had only just stopped hurting, and I was delighted to be offered a place as the youngest of six U18 girls in the RYA Volvo Laser Radial National Youth Squad. I also had a great third qualifier event in Plymouth where I was 3rd female (just behind our two best Olympic squad sailors). I am now looking forward to a winter of great training with the squad. After a winter of training the main competition season kicked off with the RYA Youth Championships and the Spring Laser Qualifiers which formed the selection events for the European Laser Radial Youth Championships. The summer was very busy as I competed in four international events. Unfortunately an incident in June left me with two cracked ribs and although I continued sailing I certainly wasn't at my fittest! However, having been selected to represent GBR at the European Laser Radial Youth Championships I wasn't going to miss the experience and managed to compete. Fitness is key to good Laser sailing, especially as the wind picks up and climbing is a great sport to build core stability and so I am very pleased that the superb Reading Climbing Centre, set-up by the well-known climber John Dunne, has offered to sponsor me with courses in climbing and the use of their facilities. I have been working on my National Indoor Climbing Award Scheme (NICAS) grades over the winter and really enjoying the work out and the satisfaction of making it to the top of increasingly hard climbs! After competing in the Laser Radial Inland Championships and a number of open Laser Radial training events over the Autumn that together formed an indicator series for the RYA Volvo Transition Training squad, I was delighted to be offered a place by the RYA in the Laser Radial Transition Training Squad. This squad supports sailors progressing from their Junior class into a new Youth class and eventually onto the demanding RYA Volvo National Youth Squad. This year it consists of 17 sailors or which 5 are female. I now have a number of squad training weekends over the winter before I start with the Laser Radial events again in the spring. After the Topper World Championships we took a decision to sell my Topper so I could focus my energies on the Laser Radial. I have had some great years in the Topper and I am sad to be moving away from such a great class, the many friends I have made and the brilliant coaches, but I can now concentrate fully on my youth boat - it's surprisingly easy to get things mixed up hopping between the two... During September and October I raced in two of the Laser Autumn Qualifiers and started getting some experience of big fleet racing in the Radial. With some Radial open training under my belt I then competed in the Laser Inland Championships at Grafham Water Sailing Club on the 12th and 13th November. Unfortunately there was no wind on the Saturday (something of a common occurrence this year! ), but Sunday proved better and three races were completed. I was reasonably happy with a 77th out of 120 competitors beating quite a few of the more experienced sailors. As I move from my junior boat to my youth boat, the Laser Radial, and start competing in Laser open events, I delighted and proud that the John Merricks Sailing Trust is supporting me, helping to fund my progress in youth sailing. The John Merricks Sailing Trust has been in operation for fourteen years and has helped many young sailors and youth sailing organisations to achieve their goals. The charitable trust was set up by those closest to John to do some good in his name and further the memory of such a remarkable person. John was one of the world's top international sailors, winning Silver in the 470 class at the 1996 Olympic Games, but he was tragically killed in a motor accident in Punta Ala, Italy, where he had been competing in the Melges 24 European Championship, less than a week earlier. I certainly hope that with their support I can achieve my own goals and put something back into the Trust. Do take a look at their website, and if you can help the Trust in its aim to advance the development of young people with a view to promoting the achievement of their potential through the sport of sailing then I know that it will be most appreciated. This year I wanted to have a go at the Isle of Sheppey Round the Island Race. This is a 41 mile endurance race (the longest in Europe) and now in its 53rd year. It takes place the first week in September and is a mix of sea, estuary and river sailing (including capsizing the boat to go under a road bridge). I decided to raise sponsorship money by completing the race to donate to two causes that are close to me - Burghfield Sailability (where I help during the summer getting disabled people sailing) and the RNLI (which all sailors should support!). I competed in my Laser Radial and in the F3-4 winds completed the event in just over 5 hours - not a bad time. I came 36th out of 112 who finished the event (a few didn't) - and clinched the first U16 helm and a nice trophy. More importantly to me though was that I raised my sponsorship money and have donated over £500 to these two good causes. As something of a departure from dinghy racing, my school nominated me this year for one of only 6 MDL Sail Training Awards.. I was fortunate to win one of these and spent a week aboard the Ocean Youth Trust yacht the John Laing towards the end of August. It was a great experience as we sailed from Ipswich to Southampton stopping off along the way. My highlight of the week was helming the John Laing through the night and watching the sunrise. It was an experience I would like to do more of... We were also presented with a trophy at the Southampton Boat Show by Lord Iliffe and Geoff Holt, and met Princess Anne who was presenting an award to the Ocean Youth Trust for everything they have done for young sailors over the last 50 years. My summer this year was largely taken up by two major competitions - first the week long Topper National Championships at North Berwick on the 31st July - 6th August followed a week later by the Topper World Championships in Ireland on the 14th - 19th August. The National Championships hosted by the East Lothian Yacht Club capped off a great finish to my junior sailing. Although the winds were light for most of the week, which I don't enjoy so much, I was really pleased to finish 18th out of the 274 competitors. I was even more pleased to finish 2nd female and pick up a nice trophy and some prizes. The World Championships were held at Dun Laoghaire in Ireland this year, and like the National Championships suffered from light and fickle winds. Unfortunately a protest was brought against me during the two day qualifying series, which I lost, leaving me in the Silver fleet and no way back! Still, these things are sent to try us and although disappointed with the World Championships I have my National Championships success to spur me on. I am proud that Ronstan will be supporting me in achieving my ambitions with a sponsorship package that includes their performance dinghy clothing and hardware. Internationally, Ronstan are one of the top three sailboat hardware brands in the world, instantly recognised and respected in 45 countries. The Laser Spring Qualifier 3 on the 7th/8th May at Pwllheli Sailing Club proved to be better - although in light winds on Saturday we were only able to complete one race, Sunday proved to be great sailing conditions with a good breeze and some big waves. With a further three races completed on the Sunday in testing conditions, and this my first decent race in the Laser Radial, I was pleased with a 54th out of 79, beating some of the more experienced sailors and on the pace for my aim of an RYA Squad at the end of the year. It's odd to think that the Laser Radial is the Olympic class female single-hander and so I am now competing against our own Olympic hopefuls. It was so cold and icy over the winter that actually sailing between squad weekends proved very difficult - the lake at my home club at Burghfield iced over for a number of weeks. The first event of the Topper year was a very light wind (and very cold) Winter Regatta at Datchet Water Sailing Club at the end of January followed by another very light wind National Series 1 at Rutland Sailing Club in April. Unfortunately I was ill at that event and so wasn't able to post a very good result. The Inland Championships in May were then the opposite, very windy followed by National Series 2 at Weymouth & Portland Sailing Academy at the end of May where the race committee only ran one race all weekend due to the strong winds which posed a safety issue with the large fleet as many of the sailors were inexperienced in strong winds. A boat failure whilst running in the top 10 at National Series 2 in that only race was very unfortunate end to the weekend. The Topper Southern Area Traveller Series has just drawn to a close with its final event at Chichester Yacht Club on the 10th October. Although I wasn't able to compete in as many of these traveller events as I would have liked due to the World Championships and National Series events clashing with a few of them, I managed to do enough events (7 out of the 11) to qualify for the series and was delighted to be awarded the prize of top female helm in the series. Yes! I knew that it would be close following the final indicator event at Largs and a few days after the event I heard the great news that I had secured a RYA Topper National Junior Squad place - this is the top of junior sailing and only some 24 places are offered each year to Topper sailors. This year it was so close that 25 sailors were offered a place (they couldn't split the final two) but only 8 of these were to girls. So, as they say, now the hard work starts... I am so pleased to be able to finish my junior sailing with a place in the National Junior Squad having done the National Intermediate Squad last year. Towards the end of next year it will be time to move into my youth boat fully - I am planning to sail the Laser Radial which is why I am doing some events as and when I can in the Laser 4.7 - same hull but a smaller sail. This year we headed down to the sun for the World Championships on the 23rd - 27th August - Malcesine Sailing Club on Lake Garda in Italy. This is a wonderful venue - clear waters and a good wind that usually kicks in at midday promised some great racing. Like the National Championships there was a qualifying and championship series, but the qualifying series was only two days, so even more pressure to do well ready for the remaining races in the championship Gold and Silver fleets. Much to my frustration I was unfortunate to trip over a bar and fall badly on some cobbles after practicing the day before the event hurting both my knees badly. I decided to race, but was in a lot of pain from the fall all of the week. As such I was very pleased to get into the Gold fleet after the first two days, but the pain was taking its toll and in the end I managed to finish 54th our of 124 competitors. Despite the knees, it was a wonderful place to sail - well worth a visit if you ever get the chance. The wind lived up to expectations all week, switching on like clockwork at midday and blowing up to a nice F3/F4. Once again this year we were back at Pwllheli Sailing Club - one of my favourite venues. The National Championships is in two series - the first is the qualifying series and then the second the championship series. During the qualifying series over the first three days all sailors race again each other in flights and at the end are split into Gold, Silver and Bronze fleets for the championships series based on their position and they sail in these fleets for the final three days. As such, the first three days are crucial for where you finish overall at the end of the week. The wind for the qualifying series was light and shifty making it difficult to be consistent and I was delighted that after some difficult races I qualified for the Gold fleet. The remaining days were much windier with a lot of swell on the last day - in fact the biggest waves I have sailed in - great fun! At the end of the week I was 81st out of 323 competitors. Travelling as the RYA Team GBR Squad to this event at Carlingford Lough Yacht Club on the 2nd - 4th July proved to be a great experience and I thoroughly enjoyed it. Unfortunately on my way out to the first race my sail ripped on the luff and I had to come ashore to do a makeshift repair. For the remaining races we had to keep repairing it, then just when I thought we had done a good repair for the final day, racing was abandoned as there was too much wind. Finishing 26th wasn't too bad after all of that! Following the Inland Championships I was delighted to be selected to join RYA Team GBR at the Topper Irish National Championships in Carlingford, Ireland, 2nd – 4th July 2010. I will be one of 12 sailors (8 boys and 4 girls) travelling as a squad to represent GBR at this event. My school also sent some information to the press when they found out I was going and the Newbury Weekly News and the Reading Post published an article about it.